Cobb Hill is an intentionally planned community in Hartland Four Corners, begun by Donella Meadows, renowned founder of the Sustainability Institute. In 1997 two local dairy farms were purchased and merged into a 260 acre co-operative community and farm. The community members are all dedicated to live in ways that are socially and ecologically responsible. Cobb Hill cheese is made from the raw milk of their grass-fed Jersey cow herd. Cobb Hill cheesemakers follow the age-old process of heating milk, adding lactic bacteria and vegetable rennet, hand stirring the curd, hooping and pressing, then aging to perfection. 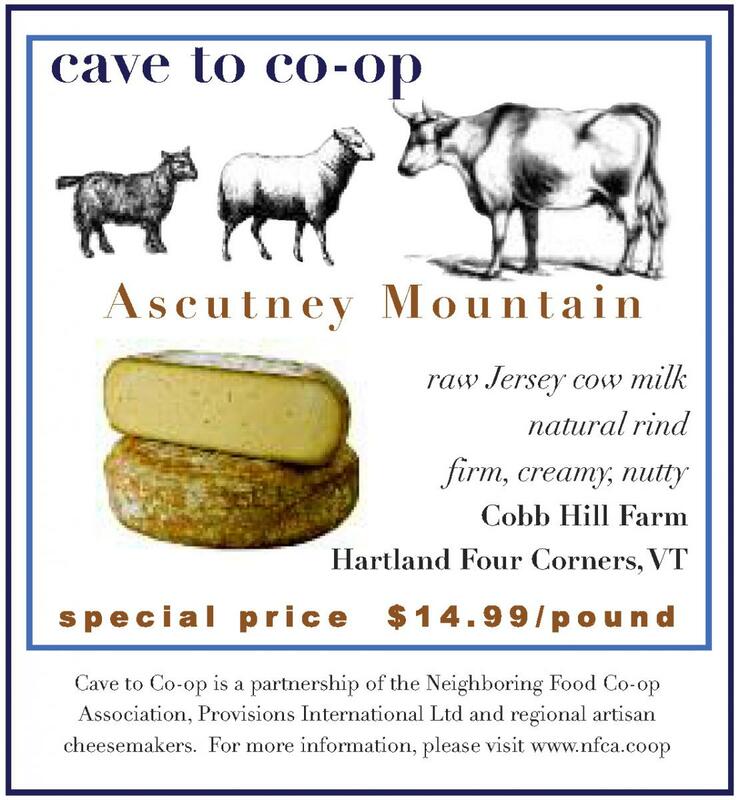 Ascutney Mountain is named after a neighboring peak, and it is a sweet and nutty natural rind tomme, modeled after Gruyère. This Alpine-style cheese is firm and creamy with a clear flavor of milk and the pasture. Here are a few seasonal early summer recipes that feature Ascutney Mountain with asparagus and herbs. Shave raw asparagus lengthwise with a peeler; toss with olive oil, lemon juice, and leaves of tender herbs (such as mint, basil, cilantro, and dill). Shave the cheese over the top; season with salt and pepper. Divide between 4 plates. Sprinkle a large baking sheet with cornmeal. Roll out dough into large circle. Transfer to baking sheet lined with parchment paper. Let stand while preparing topping. Pre-heat oven to 450°. Heat 3 tablespoons olive oil in large skillet over medium heat. Add peas; sauté 1 minute. Add 4 teaspoons water to skillet and cook until evaporated. Transfer peas to bowl. Heat 3 tablespoons oil in same skillet over medium-high heat. Add onions and sauté until beginning to brown, about 10 minutes. Reduce heat to medium; sauté until onions are golden brown, about 15 minutes longer. Sprinkle onions, prosciutto, cheese, and peas on top of the crust. Bake until golden and beginning to crisp, about 15-20 minutes. Scatter pea sprouts on top. Serve. Heat butter into a 10-inch oven-proof frying pan over medium heat. Add shallots and cook, stirring occasionally, until they soften and turn translucent, about 3 minutes. Add asparagus and cook for an additional 3 minutes. Beat the eggs and ricotta cheese together, stir in the chives and tarragon. Pour the egg mixture into the pan and cook until almost set, but still runny on top, about 4 to 5 minutes. While cooking, pre-heat oven broiler. Sprinkle shredded cheese over the eggs and put in oven to broil until cheese is melted and browned, and the center is set, about 6 to 8 minutes. Remove pan from oven with oven mitts and slide frittata onto a serving plate. Be mindful of the hot handle! Cut frittata into wedges.